And that includes me tooooooooooo! Yeeeepie!! 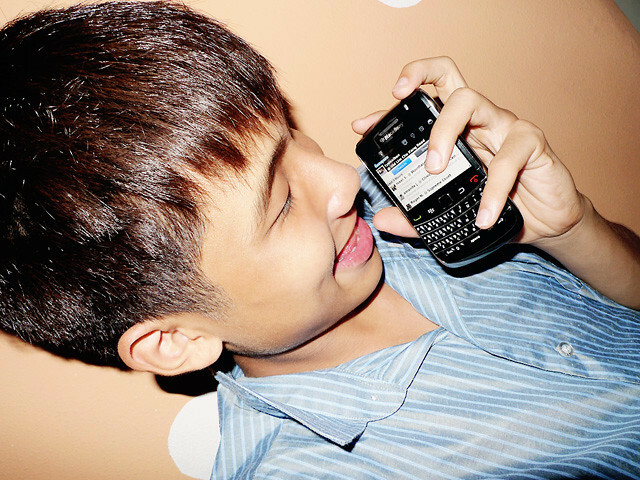 BlackBerry Bold 9700 smartphone!!!!!!!! I tell you, I was so elated when I get to know that I'm able to try out the BlackBerry Bold 9700 smartphone and to play with it for quite sometime! Especially after being persuaded by so many people to get one and me, myself wanted it so much before too (you will know if you guys did follow my tweets)! So this is a great chance for me to see if I really need this phone! As I've already got so many phones on hand and it's getting ridiculous, so I didn't get it in the end... WHICH IS SUCH A WRONG DECISION I MADE! Cause after using this phone for weeks, I cannot help but to say that I'm loving every single bit of it so much that it practically doesn't leave my hands anymore at any point of time, not even in the toilet (can tweet or bbm what!)! You can choose to place those applications that you always/usually use, at the home screen for easy usage and access! These shortcuts are awesome right! So you can see, those I place on the main screen is what I normally use, which I think most of you guys are (except for Facebook which I rarely use). 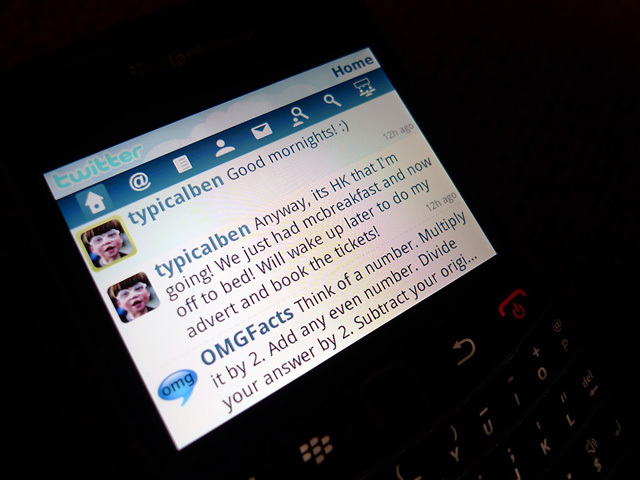 I'm using the official Blackberry Twitter application and I totally dig the interface!! It's pretty (well, at least better than many Twitter applications) and also, it's easy to navigate around to reply, DM, search, follow, etc. Uploading pictures up to Twitter is easy too, through Blackberry! One of the main highlights of Blackberry! 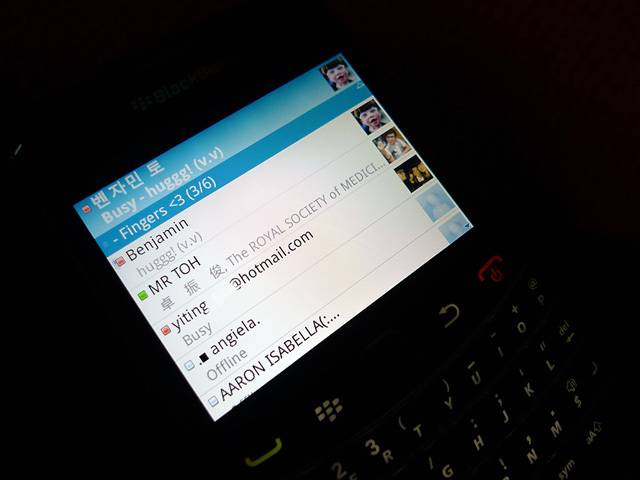 BBM is where all BlackBerry users can all easily communicate together! All you need to do is just to add your friend (who also owns a Blackberry) onto it!! 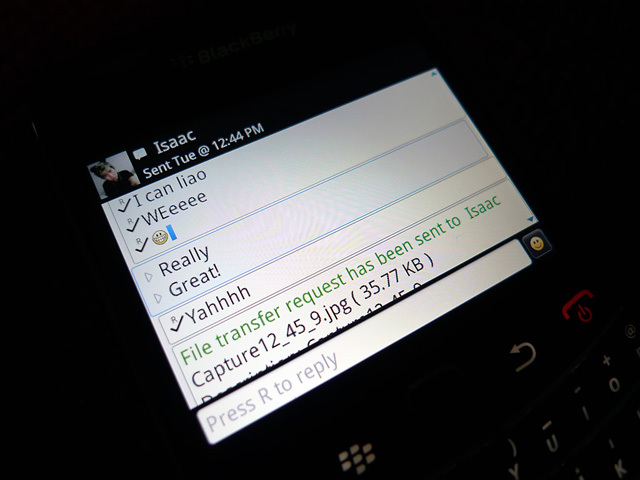 ♥ Send and receive messages with unlimited character length! ♥ Share pictures, videos, files (able to send to multiple contacts at once even)! ♥ Set up groups in BBM and indulge in group chats! It's really awesome cause everything seems so much easier with BBM! Cause you can't send pictures or videos through sms what (I know can mms but need money) and even group chats too! You can now do all these on the go lor! Save your time when you're travelling and do some discussion with friends/clients first!! Now you can be online on your Msn, 24/7 without signing out and leaving it to run at the back while you can use the phone as per normal! I can say I really had smooth experience surfing all the different websites on this phone, and pretty easy to navigate around as usual! Though I've not yet tried to blog using this phone (cause I'm not someone that can concentrate and blog on-the-go), but I know that alot of people did use Blackberry to blog cause it's really convenient and easy! For me, I always use it to approve comments and do random web surfing! Of course, there are still many other awesome applications like Facebook or even Push e-mail (receive your email in the form of sms) where you can connect your BlackBerry to up to 10 POP3/IMAP email accounts! Which inculdes all the popular web-based email services like Yahoo!, Hotmail and Gmail. And you can view and even edit your e-mail attachments wirelessly! Be it Powerpoint, Words, Excel, Adboe PDF etc. Not to say about graphics attachment too! There's really too much to share for such an awesome phone like this! should totally get this phone! 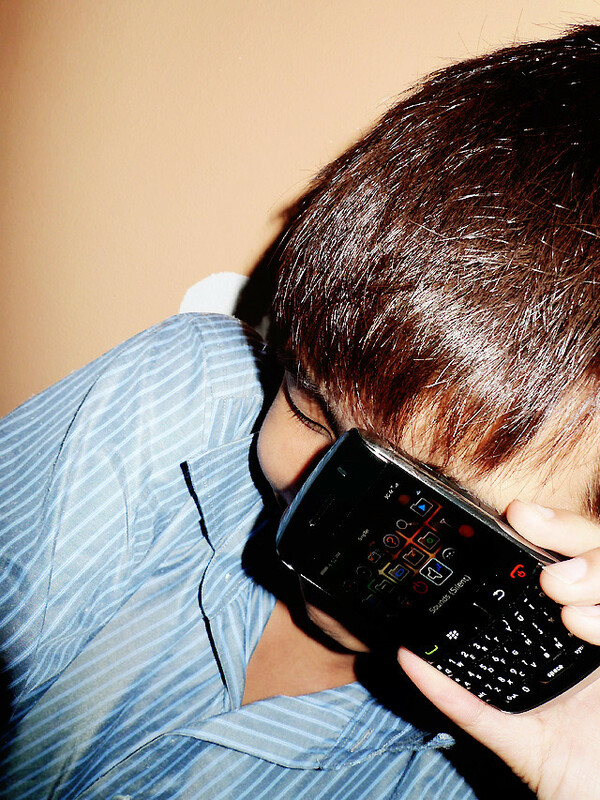 ♥ Cannot chat online 24/7 on msn and bbm? 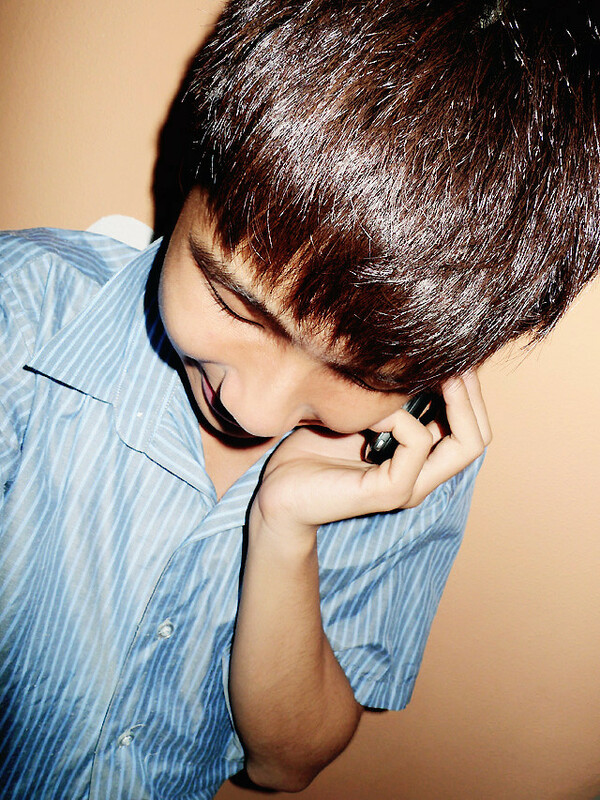 ♥ Cannot tweet as and when you want? ♥ Cannot surf the web pages smoothly as it lags badly? ♥ Cannot receive important e-mails on the go? ♥ Cannot play with Facebook on boring journey rides home? ♥ Have to worried about the crazy data charges that might occur? 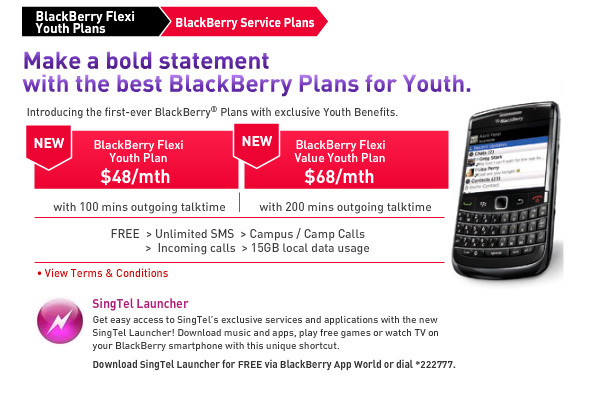 Cause SingTel have come out with the latest BlackBerry service plan that caters for the youth, like us! 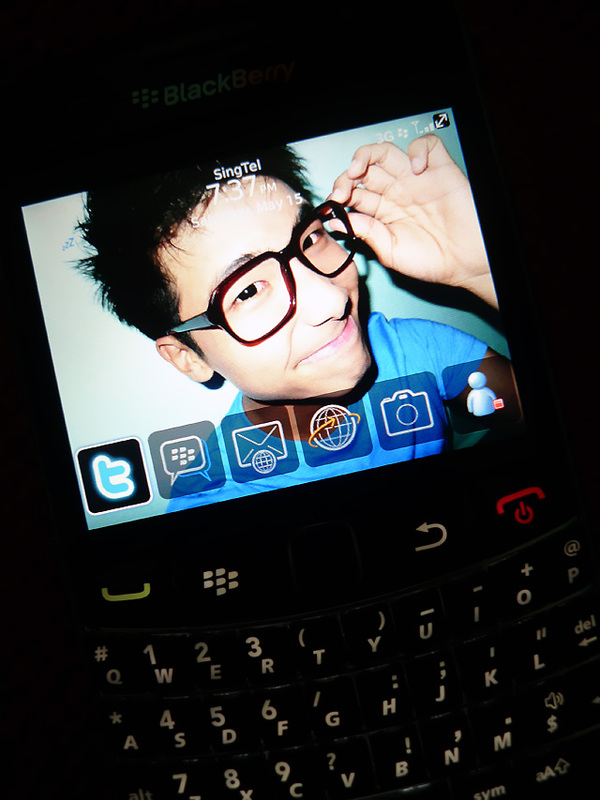 Which I deem it as the best BlackBerry plan for youth cause it has everything that we would want it to have! I personally find it's really affordable!! Cause now they combined the normal youth plan and the BlackBerry Internet Service Plan together into one, unlike last time! Where you have to add on the data plan for Blackberry on top of your youth plan which will cost even more! And now, it's 15GB of local data instead of 3GB!!! SHIOK LOR!! 15GB right, you can say it's almost can unlimited internet usage already! Which is almost IMPOSSIBLE to exceed! So we don't have to worry about the outburst of charges for data usage and can tweet, Facebook, read your emails, msn and BBM whenever and as long as you want! Furthermore, it provide amazing file compression on emails and HTML pages! Which simply means no email larger than 2KB! Nice! So students and NSF (like me), what are you waiting for? On top of the usual free unlimited SMS, outgoing calls from campus (37 tertiary institutions) and camps (11 army camps), you can to play and have fun with all Blackberry phones with SingTel's 2 new Blackberry Flexi plans! Time to munch on your Blackberry now! You guys can go over to www.singtel.com/youth for more details! Yayyyy, to better and greater deals like this! p/s: Ever since I was loan and got to use this phone, I cannot stop raving to my friends how great it is (I'm trying to ask all of them to get a Blackberry too cause we can all BBM)! Especially, when surfing the web pages with Singtel Blackberry plan! It loads really fast and I'm really amazed by it! p/p/s: Yay! 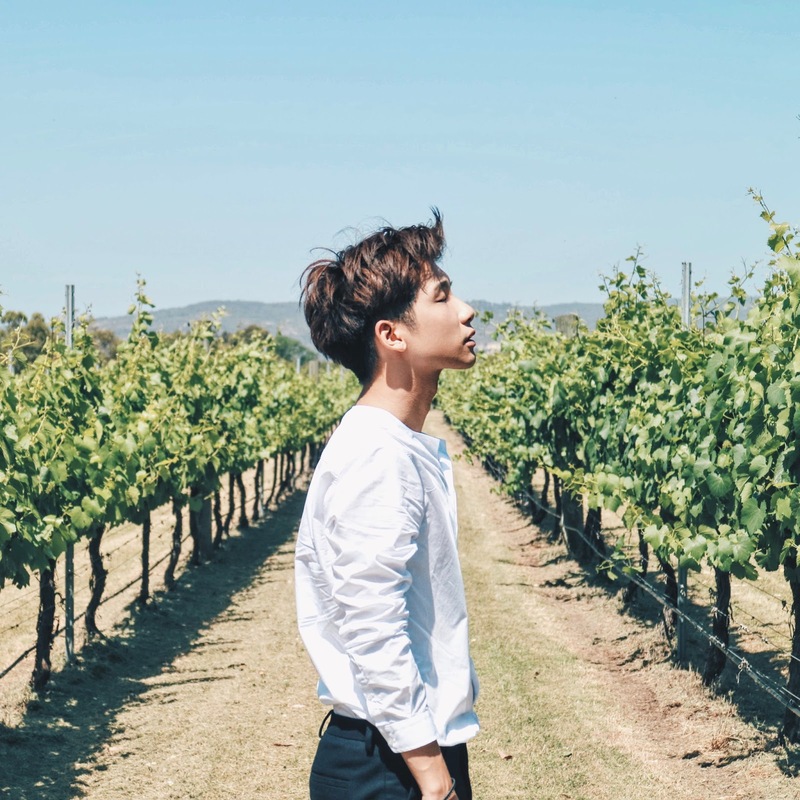 Finally this advertorial is up! I actually did it like 3 months ago! Hahaha! if you sign up for a contract, do you have to pay for the phone? I would love to own a blackberry, but my phone is still on contract :P ! That and I don't live in Singapore! How much is your bills per month? We can have 15GB of usage and not 3GB? The phone and simcard is given by Singtel, and I'm only able to use the data plan! yes i am using the flexi plan, but what's the difference between local data usage and blackberry internet service data usage?